Do companies exist and can they survive without those set of vision, mission and values statements? Surely. Many companies do exist and survive without those modern buzzwords vision, mission and values. Their owners don’t even have these words in their vocabulary. Look around you and you’ll find lots of them. Liza’s Sari-sari Store, Fatimah Jewellery, Trendy Trinkets and Gifts, Siony’s Restaurant, San Juan Funeral Homes, New World Pharmacy, Bobson Bakery, Well Star Trading and Fortune Hardware are just a few examples. Yes, companies do exist for the longest time without bothering about their vision, mission and values. But often they remain small, community-based and are barely surviving. They could not compete or lead in their respective industry. The moment a big mall is constructed in their area, they wobble and gasp for breath and resign into being small or altogether perish. Notice the products and services they offer–the same de lata, cultured pearl choker, CD case, menudo, over-the counter medicine, ensaymada, used TV set from Japan, nails and paints. It is the same buy-and-sell kind of business. The day-to-day concern is profit. We have helped a number of companies over the last few years verbalize and formalize their visions, mission and values statements. Unfortunately, often after the strategic thinking workshop, this documentation of their business concept are consigned to the filing cabinet or are typed in beautiful paper, framed and displayed all over the premises. Then they go back to “business as usual” and fighting daily bush fire. Here are two situations reported by Jim Clemmer and Art McNeil in their book, Leadership Skills for Every Manager. Dr. Edward Lindaman, former director of program control for manufacture of the Apollo spacecraft, repeatedly said: “A fundamental determinate of how we choose to behave today is our conscious or below-conscious expectation of what the future could hold in store. Before you get into telling me your troubles, what would it look like to you if the problem is resolved?” Dr. Lindaman demanded their work teams and more than 100 contractors to visualize and verbalize what the moon landing would be for them. From http://www.hq.nasa.gov. “So on July 20, 1969, the human race accomplished its single greatest technological achievement of all time when a human first set foot on another celestial body. The late-dictator Ferdinand Marcos had “the nation will be great again” agenda. But his subsequent actions and those of his co-leaders in government and business changed the word “nation” to “self” and the rest is bleak history for our country. Former president Corazon Aquino toiled toward the restoration of democracy and its machineries. She almost didn’t succeed because of some who tried to perpetuate their selfish agenda. I am not certain what the dreams of former presidents Fidel Ramos and Joseph Estrada were during their leadership but our country did not seem to move forward in real terms. Now we are supposed to rally behind “a strong republic.” But our top government executives, business, academic and spiritual leaders and their underlings, with the exception of very few, do not seem to be serious about the dream. The dream has not filtered down the ordinary citizen. And so . . . (you can draw your own conclusions). Book Shelf: If you want to know how much of your vision, mission and vision have been cascaded down the line and is serving your business and customers well, I recommend the book Delivery Quality Service (Balancing Customer Perceptions and Expectations) by Valerie A. Zeithaml, A. Parasuraman and Leonard L. Berry (The Free Press, ISBN 0-02-935702-2). 1st Congreso Internacional 2003 Panama. You are invited to attend the ASTD Global Network Panama Conference and Expo on September 17 to 19, 2003, at the Hotel Riande Continental, Panama City, Panama. Conference languages are both Spanish and English. Speakers from Africa, Australia, India, the Philippines, US, Europe and Central and South American countries will truly give this conference an international perspective. 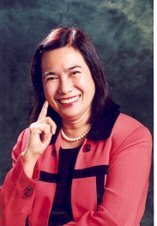 This columnist will be speaking on the topic “Leadership and Development.” For details and brochures, please call Grace Victoriano at 715-9332.